A good way of using aroma oils is to vaporize them. Aroma Oil Burners are commonly used for this purpose. To use an aroma oil burner fill the bowl at the top of the burner with water and place a few drops of aroma oils on the water, then place a lighted tea light underneath the bowl. The water and aroma oils evaporate as steam, letting the aroma of the essential oils fill the room with their fragrances! 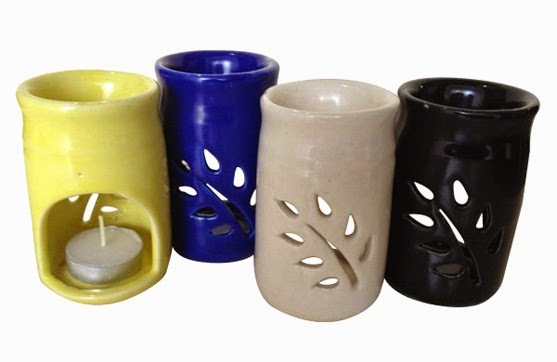 Aromatree's oil burners are handcrafted with ceramic and looks beautiful. The small Aroma Oil Lamp is 2.5 inch in diameter, 4 inch in height and holds water up to 70 ml approximately. It can diffuse fragrance upto 4 hours without the need for refilling. Available in assorted colors. Aroma oils are popular not only because of their fragrance but for the soothing and/or therapeutic properties they carry. Aromatree also offers Aroma oils that encourage a calm and peaceful state of mind, support sleep and reduce stress.